Pupils from each year group participated in two science-themed curriculum enrichment activities. Working in teams they had to solve challenges, find solutions to problems, cooperate and negotiate, and assign roles to each other within the team. The first challenge was to design and build a bridge and remote control vehicle to cover the longest possible distance. Pupils were given a selection of building materials to use, and produced some exciting and original designs covering some very impressive distances. The results of this activity were varied, including a very thoroughly designed and engineered suspension bridge, a number of single-span bridges using materials to provide strength for the structure, and a cable-car solution, which the vehicle could drive onto and be transported across a gap. The winning teams produced a sturdy bridge which had an even surface for the vehicles to travel across, and covered distances up to 2 metres. 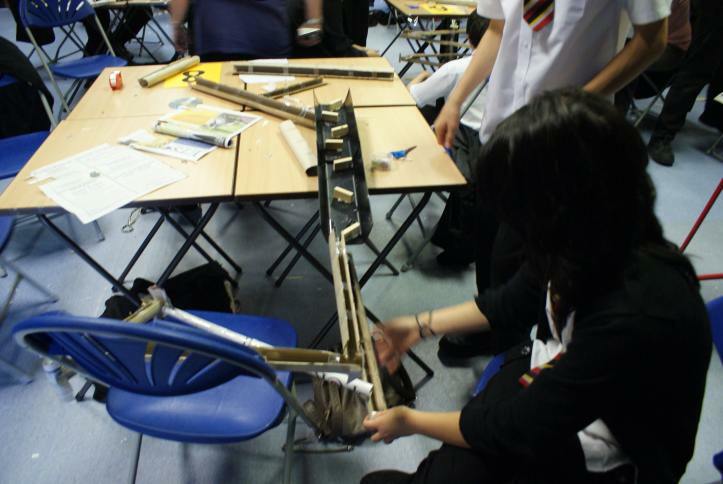 The second task was for pupils to design and build a track structure to carry a marble for the longest possible time. Again, strict rules were enforced limiting the materials available and the timing criteria. The groups soon realised that this was a more challenging task than it initially appeared and many different ideas were used, from long narrow channels to compact zig-zag tracks, to those spiralling around the desks to make maximum use of the available space. The winning teams used a combination of these techniques, and repeated trials and improvements to finalise their designs, with the best recorded time being 22 seconds.